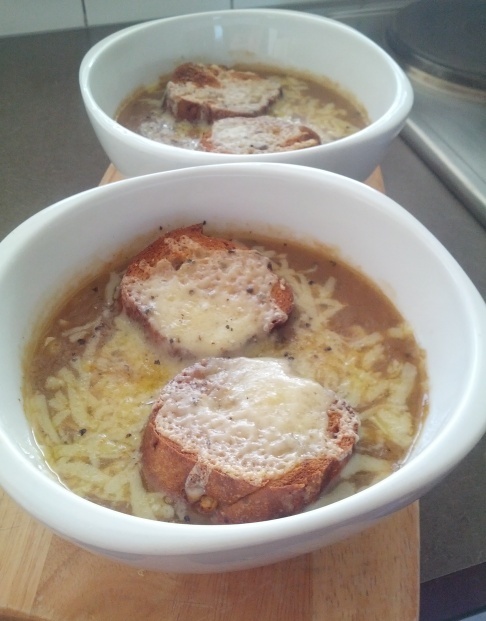 Nothing like a hearty French Onion Soup in the middle of a very cold July, plus onions are cheap at the moment. If you have time, cook the onions slowly for a good hour or so, just remember to keep an eye on them or they will catch and burn - yes, I learnt the hard way! The more the onions caramelize the sweeter they taste however you can cook the onions within 10 - 15 minutes if you are in a hurry. When I do this method I sometimes turn the heat up high so the onions start to catch (i.e just start to turn brown) then remove from the heat and give them a good stir. Peel & chop onions. The chop blade on a food processor makes quick work of this (& less tears). Melt butter and olive oil in large saucepan over a low heat. Add onions & cook slowly for 1 hour until brown & caramelized. Don't forget to check the onions don't catch and give it a good stir every 15 minutes or so. If the onions haven't coloured within the hour turn heat up a tad. If you don't have an hour cook the onions & garlic over a low heat for 10 minutes then add stock, thyme, bay leaves and increase heat to high & cook for a further 10 minutes. Season. Grill the bread as below and viola. Sprinkle over flour & stir in. Add stock, garlic, thyme & bay leaves, salt & pepper & bring to boil at medium heat. Reduce heat to low and simmer uncovered for a further 30 minutes. 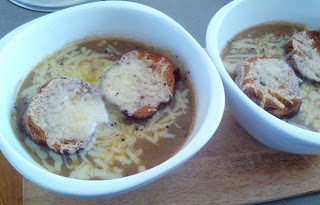 Preheat oven grill and toast bread on one side, turn over and sprinkle with grated cheese and grill until melted. Don't forget to remove bay leaves before spooning soup into bowls and top with the bread. Enjoy!